I’m not really sure when chocolate chickens were officially born, but it puts a smile on my face to know that they exist. What I can tell you is that chocolate eggs, at least in the form of the Cadbury Creme Egg we know today, first hatched in 1971, replacing an earlier type of creme-filled egg the company launched in 1923. In the spirit of Easter, let’s talk more about Cadbury Creme Eggs. Making great looking letters and numbers with candy has been a problem in the past, but not so any more. Here is a product called Letter Ice (and the numbers are called, appropriately, Number Ice). 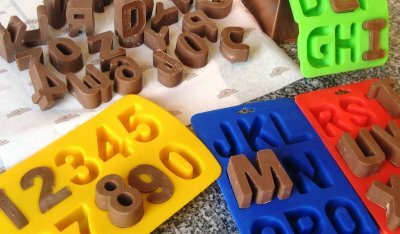 They are silicone letter and number molds. They are great for ice, jello, butter, chocolate, shortbread cookies, muffins, lollipops, etc. I made some lemonade ice cubes with them and my daughter loved them and I made a “7″ cube to put in her drink on her 7th birthday. I didn’t get to try making some candy with them – I’m more of a candy eater than a candy maker. The pictures on the website do make it look easy to do though. The only problem for me is that for me to spell CANDYADDICT I would have to do multiple batches (2 C’s, 2 A’s, 3 D’s) or buy multiple mold sets. The company is currently looking for a distributor so hopefully we will see these in stores soon.